NIA CHARLESTOWN NEVIS (SEPTEMBER 30, 2016) — The Information Technology (IT) Department in the Nevis Island Administration is the latest entity in the Nevis Island Administration to receive assistance from the government and people of the Republic of China (Taiwan). Republic of China (Taiwan) Resident Ambassador to St. Kitts and Nevis His Excellency George Gow Wei Chiou, accompanied by Minister David Y.T. 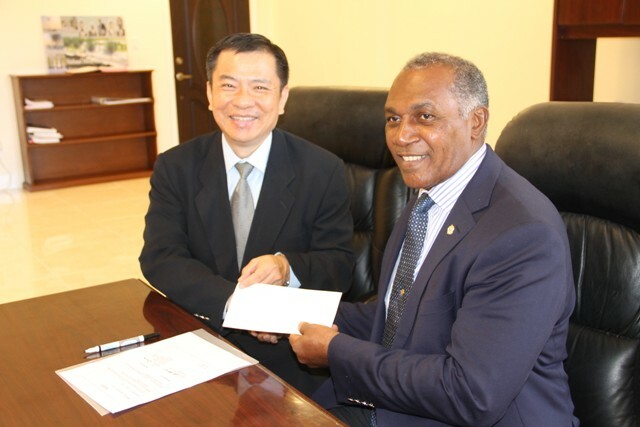 Yu, presented a cheque to Premier of Nevis Hon. Vance Amory at his Pinney’s office on September 30, 2016, to purchase equipment for the department to enhance its telecommunications network and a van to assist with their operations. 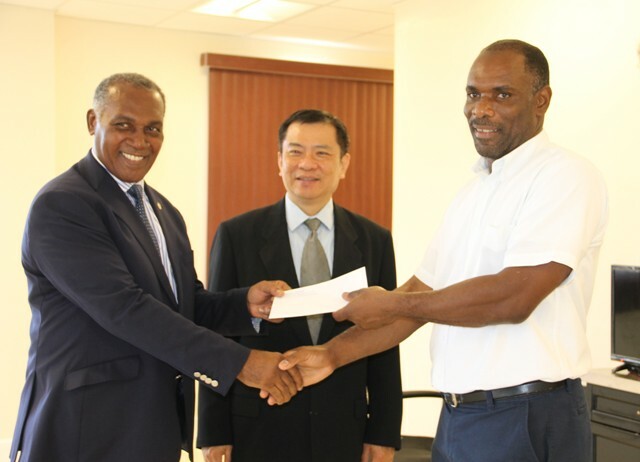 During the brief ceremony, Mr. Amory expressed gratitude to the government and people of the Republic of China (Taiwan) for their continued generosity and support to the people of Nevis. He said the funds would be utilised in an area of importance for the ongoing development of the administration and for ultimately providing an efficient service to the people of Nevis. Mr. Amory noted that he had initially made a formal request, supported by the Prime Minister of St. Kitts and Nevis and Minister of Finance Hon. Dr. Timothy Harris, to the ambassador and is pleased he acceded to the request to support the administration’s effort to provide good governance and public service to the people of Nevis. The Premier later presented the cheque to Permanent Secretary in the Ministry of Finance Mr. Colin Dore. Meantime, in brief remarks, Ambassador Chiou said in today’s world, there is the demand for efficiency from government. He said he is pleased his government was able to respond positively to the NIA’s request to support its efforts in providing an effective telecommunication service that would positively impact the lives of the people of Nevis.